.. And don't be sad upset that I am behind in updates! School and life are just way busier than I anticipated for this year, and I really need to get my head in the game & focus. So, today I have a quick nail post for you & I'm off! Since this week has been relatively sunny, I went with another pink polish from the OPI Nice Stems collection to keep me cheerful throughout the week. Be a Dahl-ia Wont You? is a bright fuchsia jelly polish, full of pearly pink & violet flecks. It's very reflective, and a beauty in the sunlight. It's relatively sheer upon first coat application, but two coats was nearly to opacity for me - I stopped there cause I was lazy! The formula is smooth & quick drying, but I found that I had chipping issues with this one - my index finger chipped on the second day! I'm wondering if things would be different had I done three coats instead. 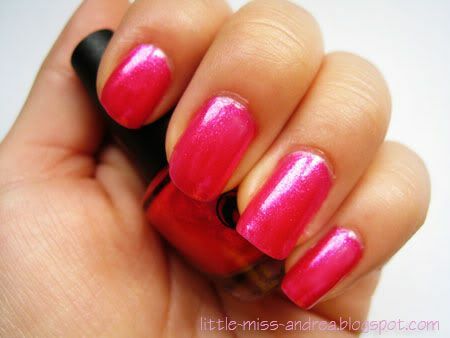 This polish is a beautiful bright pink, and I'm thinking I need it in the full size. Love it!